School Hours are 7:41 AM - 3:15 PM Regular Day and 7:41 AM to 12:05 PM on Early Release/Minimum Day. A student who graduates from Ivy High School must earn a minimum of 220 credits, including credits for certain required courses. All courses for credit must be passed with a grade of C- or better. Complete required core and elective coursework and earn the minimum letter grade required for their graduation year (D or better for Class of 2016, C or better for Class of 2017 and beyond). 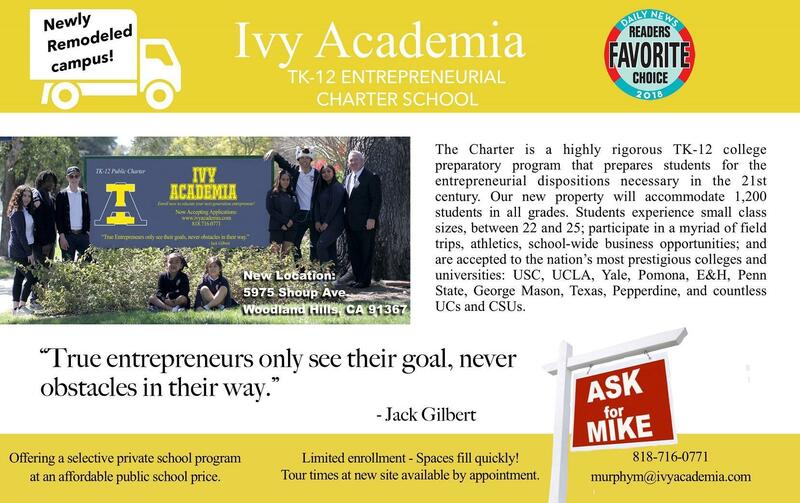 Note that core and elective coursework required for a diploma from Ivy Academia exceed state, LAUSD and UC-CSU A-G requirements, and include a career pathway of two years of business courses. A student who graduates from Ivy Academia must earn a minimum of 220 credits, including credits for certain required courses. 60 Community Service Hours (volunteer work) need to be completed, and signed off by the end of the third quarter of the student's senior year. Students in grades 9 through 11 are required to be enrolled in six classes. Students in grade 12 are required to be enrolled in four classes, unless they are credit deficient. If a student is only enrolled in four classes, they must be off campus during the free periods, except when the free period is not the first or last period of the day. When the free period falls in the middle of the school day, students will be required to report to a designated classroom or may enroll as a TA (Teacher’s Assistant) and report to the assigned classroom. When enrolling in colleges or other accredited institutions, courses must be approved in advance by the counselor and signed by the principal in order to meet minimum enrollment requirements. Final Examinations are comprehensive, as they cover the entire semester, and significant. They are particularly important for any course which meets college admission standards. A special final examination schedule is used. Students are not permitted to take final examinations early. Students have two weeks from the end of the semester to schedule makeup examinations. Until then, the student will be given the grade earned with the final examination calculated as a “0.” A grade change, as appropriate, will be approved upon completion of the final examination and assessment by the teacher. Courses may be repeated to raise the letter grade, but credit can only be earned once for most courses. The grade point average will include all grades earned in a course which has been repeated. All courses and grades will appear on the transcript. Colleges may choose to include both grades in the grade point average. The University of California stipulates that courses can only be repeated once. Courses with an earned grade of “C” or higher cannot be repeated for grade improvement, according to the University of California. Some non-college preparatory courses can be repeated for credit. Counselor can provide clarification. Determination is based on the number of credits a student has earned as of August 15th of each year. If a student has not earned enough credits to be promoted to the next grade level, the student and parents will be notiﬁed of the classiﬁcation by letter at the beginning of the school year. Students may be reclassiﬁed at each grade level. Classiﬁcation of a student is an indication that graduation from high school is in jeopardy and may require completion of additional coursework outside of the school day.